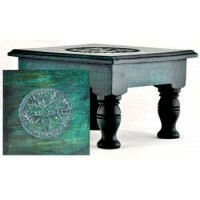 Carved triple moon altar table is great as a small shrine. 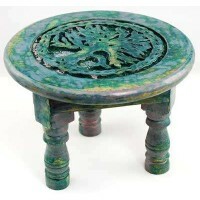 This carved Triple Moon wood table is hand made in India and is 6 inches square and 3 inches high on turned wood legs. Hand finished in black and gold with distressed finish. Great as a statue or altar stand, portable altar, and so much more! Hand made items may vary slightly. Item Number: OI-TBL13 | Approximate Size (Inches): 6.00 wide x 6.00 deep x 3.00 high | Approximate Shipping Weight: 2.50 lbs.